A recording studio is a specialized facility for sound recording, mixing, and audio production of instrumental or vocal musical performances, spoken words, and other sounds. They range in size from a small in-home project studio large enough to record a single singer-guitarist, to a large building with space for a full orchestra of 100 or more musicians. Ideally both the recording and monitoring (listening and mixing) spaces are specially designed by an acoustician or audio engineer to achieve optimum acoustic properties (acoustic isolation or diffusion or absorption of reflected sound echoes that could otherwise interfere with the sound heard by the listener). Recording studios may be used to record singers, instrumental musicians (e.g., electric guitar, piano, saxophone, or ensembles such as orchestras), voice-over artists for advertisements or dialogue replacement in film, television, or animation, foley, or to record their accompanying musical soundtracks. The typical recording studio consists of a room called the "studio" or "live room" (and sometimes additional isolation booths) equipped with microphones and mic stands, where instrumentalists and vocalists perform; and the "control room", where sound engineers, sometimes with record producers, as well, operate professional audio mixing consoles, effects units, or computers (post 1980s and 1990s) with specialized software suites to mix, manipulate (e.g., by adjusting the equalization and adding effects) and route the sound for analogue recording (on tape) or digital recording on hard disc. The engineers and producers listen to the live music and the recorded "tracks" on high-quality monitor speakers or headphones. Often, there will be smaller rooms called "isolation booths" to accommodate loud instruments such as drums or electric guitar amplifiers and speakers, to keep these sounds from being audible to the microphones that are capturing the sounds from other instruments or voices, or to provide "drier" rooms for recording vocals or quieter acoustic instruments such as an acoustic guitar a or fiddle. Major recording studios typically have a range of large, heavy, and hard-to-transport instruments and music equipment in the studio, such as a grand piano, Hammond organ, and electric piano. The machine room, where noisier equipment, such as racks of fan-cooled power amplifiers, are kept. This equipment may make noise which could interfere with the recording process. Recording studios are carefully designed around the principles of room acoustics to create a set of spaces with the acoustical properties required for recording sound with precision and accuracy. This will consist of both room treatment (through the use of absorption and diffusion materials on the surfaces of the room, and also consideration of the physical dimensions of the room itself in order to make the room respond to sound in a desired way) and soundproofing (also to provide sonic isolation between the rooms) to prevent sound from leaving the property. A recording studio has to be soundproofed on its outer shell as well, to prevent noises from the surrounding streets and roads from being picked up by microphones. A recording studio may include additional rooms, such as a vocal booth—a small room designed for voice recording, as well as one or more extra isolation booths for loud guitar stacks and extra control rooms. Even though sound isolation is a key goal, the musicians, singers, audio engineers and record producers still need to be able to see each other, to see cue gestures and conducting by a bandleader. As such, the "live room", isolation booths, vocal booths and control room typically have windows. Engineers and producers watch a trumpet player from a window in the control room during a recording session. A wide selection of microphones (cardioid microphones, condensor microphones, omnidirectional microphones, etc.). Studios often have Neuman Tube mics, AKG tube mics, RCA ribbon mics, and a number of Shure SM 57 and SM 58 mics. A wide variety of microphone stands (boom stands, straight stands, tabletop stands) to enable engineers to place microphones at the desired locations in front of singers, instrumentalists or ensembles. Consumer grade speakers, including car audio speakers, boom boxes and shelf stereo speakers. Engineers use these to hear how the finished mix will sound in regular listeners' speakers. If the engineers only listen to the mix on high-quality reference monitors, this is an excellent way to check the mix and sound, but it does not enable the engineer to hear how a consumer at home will hear the mix. Outboard effect units, such as compressors, reverbs, or equalizers. Compressors by Neve, Urei, Empirical Labs, DBX are widely used. De-essers include DBX 902. Noise gates include Drawmer DS 201. Equalizers include models by Neve and Urei. Effects include plate reverbs, spring reverbs, Roland Space Echo. Some studios stock a selection of major guitar pedals. A selection of instruments at a music studio, including a grand piano. Not all music studios are equipped with musical instruments. Some smaller studios do not have instruments, and bands and artists are expected to bring their own instruments, amplifiers and speakers. However, major recording studios often have a selection of instruments in the "live room", typically instruments, amplifiers and speaker cabinets that are large, heavy, and difficult to bring (e.g., a Hammond organ) or infeasible (as in the case of a grand piano) to bring in for a single recording session. Having musical instruments and equipment in the studio creates additional costs for a studio, as pianos have to be tuned and instruments, tube amplifiers, and speakers need to be maintained. However, it makes it more convenient for recording artists, as they do not have to bring in large, heavy gear, or for guitar amps, they do not have to bring in a number of amps and cabinets. As well, less costly studio time is spent moving in gear and setting it up. Another benefit is that microphones can be set up in appropriate locations near all of the studio-owned instruments, and bass amps can have their DI units plugged into the mixing board, which speeds up set-up time. Guitar amplifier and guitar speaker cabinets (e.g., a Fender Twin and a Marshall tube amp and speaker stack. Tube amps made by Vox, Ampeg, and Gibson may also be available. In rare cases, studios may have a mellotron ethnic drums, sitars, a double bass, or unusual instruments that bands might wish to try for a particular sound. Guitarists and bassists are often expected to bring their own guitars, basses and effects pedals. Drummers often bring their own snare drum, cymbals and sticks/brushes. The types and brands of music equipment owned by a studio depends on the styles of music for the bands and artists that typically record there. A studio that mainly records heavy metal music will be likely to have large, powerful guitar amp heads and speaker stacks (e.g., Marshall Amplification amps for guitar). In contrast, a studio which mainly records country bands will likely have a selection of smaller, vintage combo amps (e.g., 1950s Fender "tweed" combos). A studio that records a lot of 1970s-style funk may have a vintage electric piano or Clavinet. In the 2000s and 2010s, general purpose computers have rapidly assumed a large role in the recording process. With software such as Pro Tools, a powerful, good quality computer with a fast processor can replace the mixing consoles, multitrack recording equipment, synthesizers, samplers and effects unit (reverb, echo, compression, etc.) that a recording studio required in the 1980s and 1990s. A computer thus outfitted is called a Digital Audio Workstation, or DAW. Popular audio-recording software includes Apple Logic Pro, Digidesign's Pro Tools—near standard for most professional studios—Cubase and Nuendo both by Steinberg, MOTU Digital Performer—popular for MIDI and film scoring. Other software applications include Ableton Live, Mixcraft, Cakewalk Sonar, ACID Pro, FL Studio, Adobe Audition, Auto-Tune, Audacity, and Ardour. In the 2010s, software applications are more reliant on the quality of the audio recording hardware than the computer they are running on, therefore typical high-end computer hardware is less of a priority unless MIDI is involved. While Apple Macintosh is used for most studio work, there is a breadth of software available for Microsoft Windows and Linux. If no mixing console is used and all mixing is done using only a keyboard and mouse, this is referred to as mixing in the box ("ITB"). The "OTB" is used when mixing with other hardware and not just the PC software. A small, personal recording studio is sometimes called a project studio or home studio. Such studios often cater to specific needs of an individual artist, or are used as a non-commercial hobby. The first modern project studios came into being during the mid-1980s, with the advent of affordable multitrack recording devices, synthesizers and microphones. The phenomenon has flourished with falling prices of MIDI equipment and accessories, as well as inexpensive direct to disk recording products. Recording drums and amplified electric guitar in a home studio is challenging, because they are usually the loudest instruments. Conventional drums require sound isolation in this scenario, unlike electronic or sampled drums. Getting an authentic electric guitar amp sound including power-tube distortion requires a power attenuator (either power-soak or power-supply based) or an isolation box, or booth. A convenient compromise is amp simulation, whether a modelling amp, preamp/processor, or software-based guitar amp simulator. 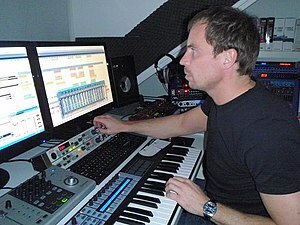 Sometimes, musicians replace loud, inconvenient instruments such as drums, with keyboards, which today often provide somewhat realistic sampling. The capability of digital recording introduced by the Alesis ADAT and its comparatively low cost, originally introduced at $3995, were largely responsible for the rise of project studios in the 1990s. An isolation booth is a standard small room in a recording studio, which is both soundproofed to keep out external sounds and keep in the internal sounds, and like all the other recording rooms in sound industry, it is designed for having a lesser amount of diffused reflections from walls to make a good sounding room. A drummer, vocalist, or guitar speaker cabinet, along with microphones, is acoustically isolated in the room. A professional recording studio has a control room, a large live room, and one or more small isolation booths. All rooms are soundproofed by varying methods, including but not limited to, double-layer 5/8” sheetrock with the seams offset from layer to layer on both sides of the wall that is filled with foam, batten insulation, or cardboard egg crates, a double wall, which is an insulated wall built next to another insulated wall with an air gap in-between, by adding foam to the interior walls and corners, also known as ‘’bass traps’’, and by using two panes of 1/2” or thicker glass on 5-15 degree angles reflecting the sound downward towards a carpet or other sound catching medium along with an air gap of 1” minimum on the smaller side of the V shape created by the two panes. This is just a basic starting point for a home studio and a studio designer would be a wise choice to hire. Using Table 3.1 Surface densities of common building materials and using the formula TL = 14.5logMf-16 can be used to calculate the transmission loss of various frequencies through materials. Thomas A. Watson invented, but did not patent, the soundproof booth for use in demonstrating the telephone with Alexander Graham Bell in 1877. There are variations of the same concept, including a portable standalone isolation booth, a compact guitar speaker isolation cabinet, or a larger guitar speaker cabinet isolation box. A gobo panel achieves the same idea to a much more moderate extent; for example, a drum kit that is too loud in the live room or on stage can have acrylic glass see-through gobo panels placed around it to deflect the sound and keep it from bleeding into the other microphones, allowing more independent control of each instrument channel at the mixing board. All rooms in a recording studio may have a reconfigurable combination of reflective and non-reflective surfaces, to control the amount of reverberation. In animation, vocal performances are normally recorded in individual sessions, and the actors have to imagine (with the help of the director or a reader) they are involved in dialogue (as opposed to a monologue). Animated films often evolve rapidly during both development and production, so keeping vocal tracks from bleeding into each other is essential to preserving the ability to fine-tune lines up to the last minute. Sometimes, if the rapport between the lead actors is strong enough and the animation studio can afford it, the producers may use a recording studio configured with multiple isolation booths in which the actors can see each another and the director. This enables the actors to react to one another in real time as if they were on a regular stage or film set. In the era of acoustical recordings (prior to the introduction of microphones, electrical recording and amplification), the earliest recording studios were very basic facilities, being essentially soundproof rooms that isolated the performers from outside noise. During this era it was not uncommon for recordings to be made in any available location, such as a local ballroom, using portable acoustic recording equipment. In this period, master recordings were made by cutting a rotating cylinder (later disc) made from wax. Performers were typically grouped around a large acoustic horn (an enlarged version of the familiar phonograph horn). The acoustic energy from the voices or instruments was channeled through the horn's diaphragm to a mechanical cutting lathe located in the next room, which inscribed the signal as a modulated groove directly onto the surface of the master. Following the invention and commercial introduction of the microphone, the electric amplifier, the mixing desk and the loudspeaker, the recording industry gradually converted to electric recording, and by 1925 this technology had replaced mechanical acoustic recording methods for such major labels as RCA Victor and Columbia, and by 1933 acoustic recording was completely obsolete. The Siemens Studio for Electronic Music ca. 1956. Electrical recording was common by the early 1930s, and mastering lathes were electrically powered, but master recordings still had to be cut into a disc, by now a lacquer, also known as an Acetate disc. In line with the prevailing musical trends, studios in this period were primarily designed for the live recording of symphony orchestras and other large instrumental ensembles. Engineers soon found that large, reverberant spaces like concert halls created a vibrant acoustic signature as the natural reverb enhanced the sound of the recording. In this period large, acoustically "live" halls were favored, rather than the acoustically "dead" booths and studio rooms that became common after the 1960s. Because of the limits of the recording technology, which did not allow for multitrack recording techniques, studios of the mid-20th century were designed around the concept of grouping musicians (e.g., the rhythm section or a horn section) and singers (e.g., a group of backup singers), rather than separating them, and placing the performers and the microphones strategically to capture the complex acoustic and harmonic interplay that emerged during the performance. In the 2000s, modern sound stages still sometimes use this approach for large film scoring projects that use large orchestras. Because of their superb acoustics, many of the larger studios were converted churches. Examples include George Martin's AIR Studios in London, the famed Columbia Records 30th Street Studio in New York City (a converted Armenian church, with a ceiling over 100 feet high), and the Decca Records Pythian Temple studio in New York (where artists like Louis Jordan, Bill Haley and Buddy Holly were recorded) which was also a large converted church that featured a high, domed ceiling in the center of the hall. Facilities like the Columbia Records 30th Street Studio in New York and EMI's Abbey Road Studio in London were renowned for their 'trademark' sound—which was (and still is) easily identifiable by audio professionals—and for the skill of their staff engineers. As the need to transfer audio material between different studios grew, there was an increasing demand for standardization in studio design across the recording industry, and Westlake Recording Studios in West Hollywood was highly influential in the 1970s in the development of standardized acoustic design. In New York City, Columbia Records had some of the most highly respected sound recording studios, including the Columbia 30th Street Studio at 207 East 30th Street, the CBS Studio Building at 49 East 52nd Street, Liederkranz Hall at 111 East 58th Street between Park and Lexington Avenues (a building built by and formerly belonging to a German cultural and musical society, The Liederkranz Club and Society), and one of their earliest recording studios, "Studio A" at 799 Seventh Avenue. Electric recording studios in the mid-20th century often lacked isolation booths, baffles, and sometimes even speakers, and it was not until the 1960s, with the introduction of the high-fidelity headphones that it became common practice for performers to use headsets to monitor their performance during recording and listen to playbacks. It was difficult to isolate all the performers—a major reason that this practice was not used simply because recordings were usually made as live ensemble 'takes' and all the performers needed to be able to see each other and the ensemble leader while playing. The recording engineers who trained in this period learned to take advantage of the complex acoustic effects that could be created through "leakage" between different microphones and groups of instruments, and these technicians became extremely skilled at capturing the unique acoustic properties of their studios and the musicians in performance. The use of different kinds of microphones and their placement around the studio was a crucial part of the recording process, and particular brands of microphone were used by engineers for their specific audio characteristics. The smooth-toned ribbon microphones developed by the RCA company in the 1930s were crucial to the "crooning" style perfected by Bing Crosby, and the famous Neumann U47 condenser microphone was one of the most widely used from the 1950s. This model is still widely regarded by audio professionals as one of the best microphones of its type ever made. Learning the correct placement of microphones was a major part of the training of young engineers, and many became extremely skilled in this craft. Well into the 1960s, in the classical field it was not uncommon for engineers to make high-quality orchestral recordings using only one or two microphones suspended above the orchestra. In the 1960s, engineers began experimenting with placing microphones much closer to instruments than had previously been the norm. The distinctive rasping tone of the horn sections on the Beatles recordings "Good Morning Good Morning" and "Lady Madonna" were achieved by having the saxophone players position their instruments so that microphones were virtually inside the mouth of the horn. The unique sonic characteristics of the major studios imparted a special character to many of the most famous popular recordings of the 1950s and 1960s, and the recording companies jealously guarded these facilities. According to sound historian David Simons, after Columbia took over the 30th Street Studios in the late 1940s and A&R manager Mitch Miller had tweaked it to perfection, Miller issued a standing order that the drapes and other fittings were not to be touched, and the cleaners had specific orders never to mop the bare wooden floor for fear it might alter the acoustic properties of the hall. There were several other features of studios in this period that contributed to their unique "sonic signatures". As well as the inherent sound of the large recording rooms, many of the best studios incorporated specially-designed echo chambers, purpose-built rooms which were often built beneath the main studio. These were typically long, low rectangular spaces constructed from hard, sound-reflective materials like concrete, fitted with a loudspeaker at one end and one or more microphones at the other. During a recording session, a signal from one or more of the microphones in the studio could be routed to the loudspeaker in the echo chamber; the sound from the speaker reverberated through the chamber and the enhanced signal was picked up by the microphone at the other end. This echo-enhanced signal—which was often used to 'sweeten' the sound of vocals—could then be blended in with the primary signal from the microphone in the studio and mixed into the track as the master recording was being made. Special equipment was another notable feature of the "classic" recording studio. The biggest studios were owned and operated by large media companies like RCA, Columbia and EMI, who typically had their own electronics research and development divisions that designed and built custom-made recording equipment and mixing consoles for their studios. Likewise, the smaller independent studios were often owned by skilled electronics engineers who designed and built their own desks and other equipment. A good example of this is the famous Gold Star Studios in Los Angeles, the site of many famous American pop recordings of the 1960s. Co-owner David S. Gold built the studio's main mixing desk and many additional pieces of equipment and he also designed the studio's unique trapezoidal echo chambers. During the 1950s and 1960s, the sound of pop recordings was further defined by the introduction of proprietary sound processing devices such as equalizers and compressors, which were manufactured by specialist electronics companies. One of the best known of these was the famous Pultec equalizer, which was used by almost all the major commercial studios of the time. With the introduction of multi-track recording, it became possible to record instruments and singers separately and at different times on different tracks on tape, although it was not until the 1970s that the large recording companies began to adopt this practice widely, and throughout the 1960s many "pop" classics were still recorded live in a single take. After the 1960s, the emphasis shifted to isolation and sound-proofing, with treatments like echo and reverberation added separately during the mixing process, rather than being blended in during the recording. One regrettable outcome of this trend, which coincided with rising inner-city property values, was that many of the largest studios were either demolished or redeveloped for other uses. In the mid 20th century, recordings were analog, made on ¼-inch or ½-inch magnetic tape, or, more rarely, on 35mm magnetic film, with multitrack recording reaching 8 tracks in the 1950s, 16 in 1968, and 32 in the 1970s. The commonest such tape is the 2-inch analog, capable of containing up to 24 individual tracks. Generally, after an audio mix is set up on a 24-track tape machine, the signal is played back and sent to a different machine, which records the combined signals (called printing) to a ½-inch 2-track stereo tape, called a master. Before digital recording, the total number of available tracks onto which one could record was measured in multiples of 24, based on the number of 24-track tape machines being used. In the 2010s, most recording studios now use digital recording equipment, which limits the number of available tracks only on the basis of the mixing console's or computer hardware interface's capacity and the ability of the hardware to cope with processing demands. Analog tape machines are still used by some audiophiles and sound engineers, who believe that digitally recorded audio as sounding too harsh and who believe that tape has a "warmer" sound. The scarcity and age of analog tape machines has increased their value, as does the fact that some audio engineers still believe in recording to analog tape. Radio studios are very similar to recording studios, particularly in the case of production studios which are not normally used on-air, such as studios where interviews are taped for later broadcast. This type of studio would normally have all of the same equipment that any other audio recording studio would have, particularly if it is at a large station, or at a combined facility that houses a station group, but is also designed for groups of people to work collaboratively in a live-to-air situation (see Ahern, S, Making Radio). Broadcast studios also use many of the same principles such as sound isolation, with adaptations suited to the live on-air nature of their use. Such equipment would commonly include a telephone hybrid for putting telephone calls on the air, a POTS codec for receiving remote broadcasts, a dead air alarm for detecting unexpected silence, and a broadcast delay for dropping anything from coughs to profanity. In the U.S., stations licensed by the Federal Communications Commission (FCC) also must have an Emergency Alert System decoder (typically in the studio), and in the case of full-power stations, an encoder that can interrupt programming on all channels which a station transmits in order to broadcast urgent warnings. Computers are also used for playing ads, jingles, bumpers, soundbites, phone calls, sound effects, traffic and weather reports, and now full broadcast automation when no staff are present. For talk shows, a producer or assistant in a control room runs the show, including screening calls and entering the callers' names and subject into a queue, which the show's host can see and make a proper introduction with. Radio contest winner interviews can also be edited "on the fly" and put on the air within a minute or two after they have been recorded accepting their prize. Additionally, digital mixing consoles can be interconnected via audio over Ethernet, or split into two parts, with inputs and outputs wired to a rackmount audio engine, and one or more control surfaces (mixing boards) or computers connected via serial port, allowing the producer or the talent to control the show from either point. With Ethernet and audio over IP (live) or FTP (recorded), this also allows remote access, so that DJs can do shows from a home studio via ISDN or the Internet. Additional outside audio connections are required for the studio/transmitter link for over-the-air stations, satellite dishes for sending and receiving shows, and for webcasting or podcasting. ^ Huber, David Miles (2005). Modern Recording Techniques. Elsevier Inc. ISBN 9780240806259. ^ Watson, T.A. (2017). The Birth and Babyhood of the Telephone. Library of Alexandria. ISBN 9781465616609. ^ a b Simons, David (2004). Studio Stories - How the Great New York Records Were Made. San Francisco: Backbeat Books. ^ Newell, Philip (2003). Recording Studio Design. Focal Press. pp. 315–316. ISBN 0-240-51917-5. Retrieved 14 January 2017. ^ "History of The Liederkranz of the City of New York" Archived 2011-07-27 at the Wayback Machine - The Liederkranz of the City of New York website. The Liederkranz Club put up a building in 1881 at 111-119 East 58th Street, east of Park Avenue. Cogan, Jim; Clark, William. Temples of Sound: Inside the Great Recording Studios. San Francisco: Chronicle Books, 2003. Horning, Susan Schmidt. Chasing Sound: Technology, Culture, and the Art of Studio Recording from Edison to the LP. Baltimore: Johns Hopkins University Press, 2013. Ramone, Phil; Granata, Charles L. Making Records: The Scenes Behind the Music. New York: Hyperion, 2007.